Maggie Meehan ’21 led the Ephs with 14 points in the final g ame against Tufts of the Williams Holiday Classic Tournament. Photo courtesy of Sports Information. Last Friday and Saturday, women’s basketball (4-3) played in the Williams Holiday Classic tournament, defeating Alfred with a lopsided margin of 81-40 before falling to Tufts 67-41. 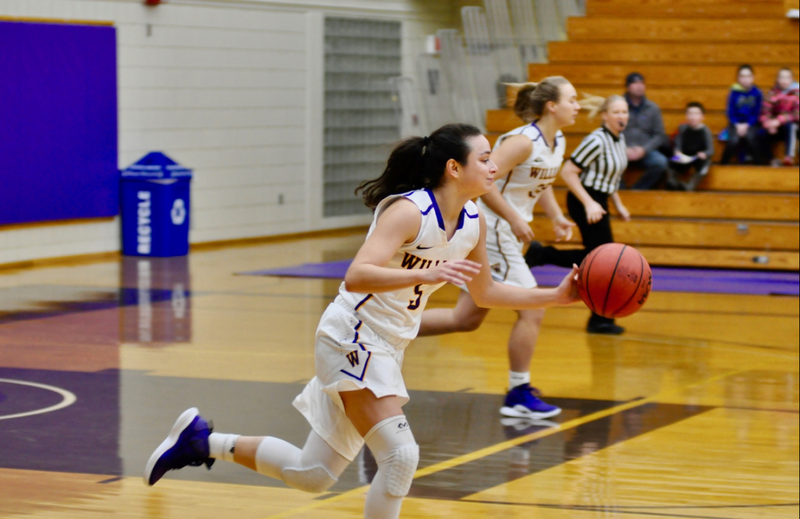 On Friday against Alfred, all of the Ephs who played had points on the board, with three in double-digits – co-captain Lauren Vostal ’19 (16 points), Emily Chang ’20 (13 points) and co-captain Lexi Jones ’19 (11 points and seven rebounds). Gabby Martin ’21 had the most assists for Williams, with four. The Ephs wasted no time building up their lead in the first period, with Vostal scoring eight points within the first two minutes alone. Alfred experienced some shooting troubles but was shored up by Lyndsey McCoy and Jamie Wilcox, who pushed ahead to put the Saxons on the board with a layup apiece. The Ephs built up a strong lead quickly, with Maggie Meehan ’21 and Jones both scoring five points each. Williams ended the first quarter up 30-10 and did not lose the lead for the rest of the game. The rest of the half saw more success from the Ephs, both in scoring and in rebounds. After subbing in around four minutes in, Chang made three three-point shots within a minute and a half, boosting Williams to 49-17 over the Saxons. The Ephs would score once more before the end of the second period, with Caroline Lovisolo ’19 sinking a jump shot. She was answered by Chanice Battle for the Saxons, who made a speedy layup with about 30 seconds on the clock to end the half with Williams up 51-22. Williams held a lead of 29 points or more for the entire third period. A relatively low-scoring third quarter saw the teams fall almost even in scoring. Boland posted four points for her team in an attempt to ward off the Ephs, but it was not enough to stop the women from retaining the lead. With 10 seconds to go in the period, Wilcox made a steal to sink Alfred’s first three-pointer of the game. The Ephs went into the fourth quarter up 63-33. Layups from across the Ephs’ roster and a three-pointer from Meghan Voss ’21 helped Williams maintain a large lead for the rest of the game. Alfred’s Hicks managed two steals and scored three points for her team in an effort to make a comeback for the Saxons but fell short. In the end, Williams ran out the clock, ending the match 81-40. “We feel our execution is getting better. We’re moving the ball better; our energy is where it needs to be,” Manning said. On Saturday afternoon, the women suffered their third loss of the winter season, falling to Tufts in the Holiday Classic Championship game. Tufts (6-0), ranked sixth in the country, has won all five of its games this season by double digits. A solid defensive effort from Tufts and costly misplaced shots from Williams were consistent themes throughout the game, as the Ephs struggled to find holes in the Jumbos’ defense and were often forced into tough positions. Meehan was the top scorer, netting 14 points. Katie Brule ’20 registered 11 points and seven rebounds and Vostal had five points and 10 rebounds. Jac Knapp of the Jumbos sank 18 points, followed by Emily Briggs with 11 points and five rebounds and Erica DeCandido with eight points and six rebounds. As the ball came down from the tip-off, it was clear that this would be a high-energy game from both teams. The first quarter was optimistic for Williams – even though Tufts gained five points right off the bat, the Ephs kept pace and matched Tufts in rebounds. However, the Jumbos locked up the ball quickly as Briggs took advantage of the Jumbos’ defense to score and shot 55.6 percent over the first half. Tufts took a slight lead halfway through the first period and maintained their distance in scoring throughout the rest of the quarter, ending up 17-13 over Williams. The Jumbos really picked up the pace in the second period, out-rebounding the Ephs and building up a consistent 10-point lead. Meehan pushed back, scoring four points for the Ephs, but the team was still heavily outscored for the rest of the half, which ended with Tufts on top 32-20. Erica DeCandido of the Jumbos picked up an early layup in the second half, which began an almost three-minute break in scoring for both teams. The dry spell was broken by Tufts’ Cailin Harrington, who sunk a jump shot to signal an end to the drought. Brule responded to the challenge, scoring four points for the Ephs and getting momentum going for the women. Williams managed to out-rebound Tufts in the third period but once again fell short on scoring. The teams went into the fourth quarter with Tufts up 53-29. Williams played their most competitive quarter in the fourth period, only scoring two points less than Tufts. Meehan and Maddy Mandyck ’22 bagged four points apiece to contribute to the Ephs’ total of 12. Tufts countered with scattered shots from across the bench, using effective coordination to once again out-rebound the Ephs and pick up 14 more points, increasing their lead to 67-41 by the end of the game. The women went up against MCLA last night, but results came in too late to report. Williams will hit the road this Thursday to face Vassar at 7 p.m. and will host Wesleyan on Saturday at 3 p.m.